This rather colourful name seems to derive from the appearance of the glen on the S side of Sawel. 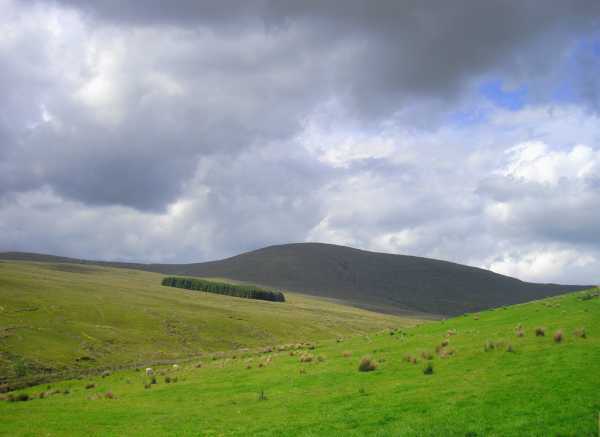 Sawel is the highest mountain in the Sperrin Mountains area and the 147th highest in Ireland. Sawel is the highest point in county Derry and also the highest in Tyrone. Gave this one another stab with my trusty dog Susie after not even being able to find the start point a year ago. Began at the usual start point: coming from the Glenelly Valley, travel a couple of miles up Sperrin Rd, park at the fence just past the second cattle grid, shortly after passing a large shed on the left. As others have said, the County Rock is a little way up the hill on the other side of the road if you cross the gate, and is well worth a look, if only for photo opps where you can mark out Tyrone and Derry! The fence leading up the long eastern shoulder is reassuring and I tended not to wander too far from it. This was a steady ascent although a number of jumps were needed to avoid boggier parts - added to the experience though. The summit does look very far away from the lower heights though it came upon me very suddenly in the end. The ever widening views are excellent and as this was my highest peak to date, I had that 'on top of the world' feeling nearing the summit. Great views east along the range: Slieve Gallion with its transmitter, and Lough Neagh narrowly visible behind it, could be seen to the south east. Looking north, I could see the village of Park (? ), a couple of wind farms and the distinctive profile of Benbradagh beyond Dungiven. Further up I could see the distinctive profile of Binevenagh, with Lough Foyle and Inishowen to the west. At the summit there were good views west along the range to Dart and what I assumed was Mullaghclogha beyond (which actually looked higher than Sawel). My preconceptions were jarred somewhat I must admit: for some reason I expected a short descent and a tightrope-esque ridge leading to the summit of Dart when in reality it was quite a steep drop and a very broad ridge (no danger of falling off then! ), which made the neighbouring summit look further away than it was. But having come this far I couldn't resist and made my way downhill again (will cover Dart in more detail in a separate comment). I ended up descending the other side of Dart using the track others have mentioned, until I reached the Glenelly Valley again, then east along the main road past the Heritage Centre then up Sperrin Rd again. This meant a very long walk in total: as others have suggested it might be an idea to take two cars if possible. For a relatively sunny and clear day, and considering Sawel's position as the highest in the range (and a county peak, if not two), I didn't meet one other walker, although there was another car parked at the start point when I set off.